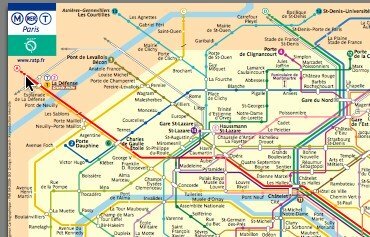 Here you can find and download a detailed Paris Metro/RER Map perfect for printing on an inkjet printer. 4×6 photo paper works best, which allows extremely high resolution prints. As long as you don’t require reading glasses, this will be the most compact, detailed and useful Paris metro map. Try printing this without margins and expanding or zooming the map to the edges of the paper if your printing software allows it. This will maximize your 4×6 paper, making the metro lines map as readable as possible while remaining small and compact. For those who prefer large print, print this PDF metro map using regular or high quality 8.5 x 11″ paper in landscape mode and then fold it like a letter or a brochure so that the middle of the sheet doesn’t become creased and illegible after folding and re-folding. This RATP Paris Metro RER map covers all 14 metro lines (16 if you include the “bis” lines) and the 5 regional train lines RER A to E. The Metro RER Zones are not printed on this map but the darker shade is Zone 2, with the lighter tan/beige being Zone 1 or Central Paris. There are a lot of popular destinations outside of Paris that are noted near the edges of this map, but the stops aren’t actually shown, such as Charles de Gaulle (CDG) and Orly (ORY) airports. For those destinations you’ll have to download the Paris RER Map.